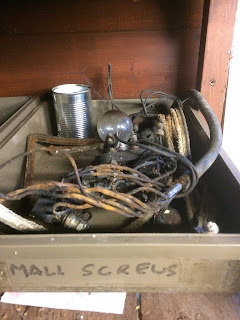 This week, Dave Keith and myself were at the signal box and continued to get things done. Keith is continuing with the decorating in the Cowley bridge room. Dave brought down some new stock for the cafe and logged it all in a 'stock check'. He then proceeded to install a shelf in the kitchen to display items for sale, e.g. Mugs, crisps and various other food products. Dave then went around with his labelling machine to display prices for the things on sale. I started the day by attending to the searchlight signal. 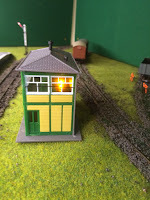 It had been causing problems to the computerised systems of Cowley Bridge miniature signal box. We purchased a backup battery power supply unit and this improved the situation but there was still interface getting through. I had a discussion with Dave last week, and we thought that putting a capacitor across the electormagnet of the signal might fix the problem, which it did. 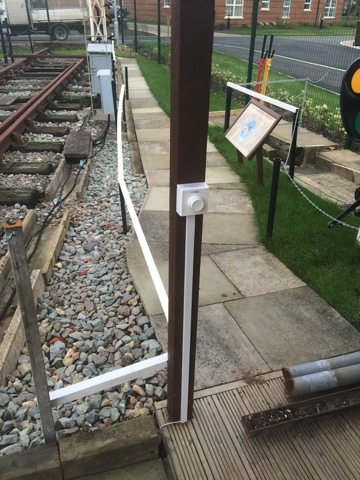 I then proceeded to add a remote control button to the signal so visitor can trigger the signal from a distance (veranda of the Cowley building). Dave then proceeded to cover it in labels so people knew what it did. After lunch I went on to start to fix up the folding table in the lean to, but as Dave is the only person with a drill, I was using his and he had to leave, so I had to stop, but I will finish this later. 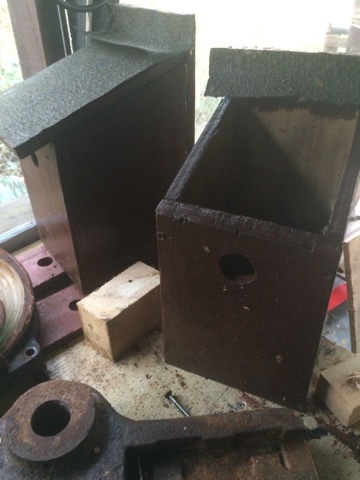 With no power tools, I decided to finish off the bird boxes I started making a while back. All that needed doing was making a tight fitting lid. There is now only one left to finish and then they can be put up. 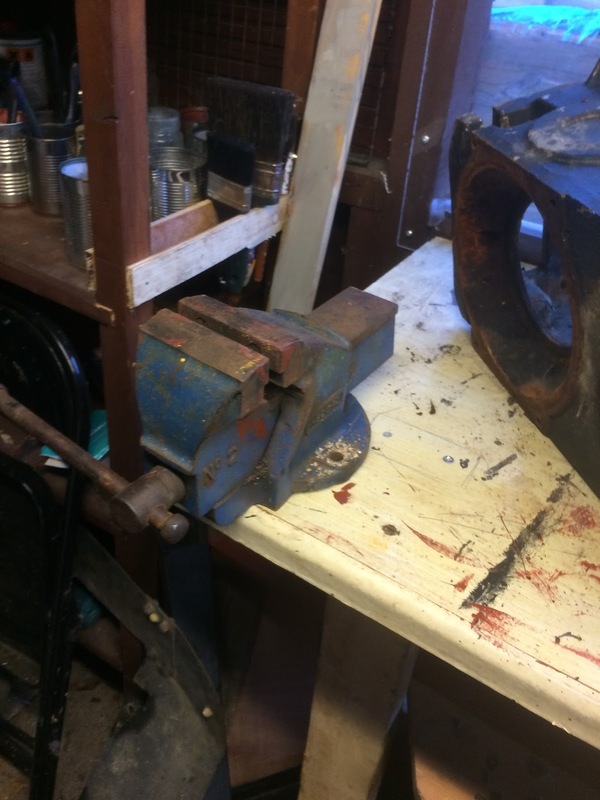 I also fixed the vice to the new raised work bench. There's always thing to do on site and progress can be slow. But we are getting thing done slowly but steadily. The exciting news is that this weekend is the start of our twice a month opening. We shall be open on Saturday for the usual time period and the usually services will be available. Come along and see the progress. Dave Keith and I were over the signal box today doing some work in various places on site. Keith has recently been spending a lot of time in the Cowley Bridge Building putting baton over the joins in the ply wood 'walls'/ceiling. This was originally done with masking tape, which was not really right for the job, so he is replacing this with wooden baton and then painting it in. 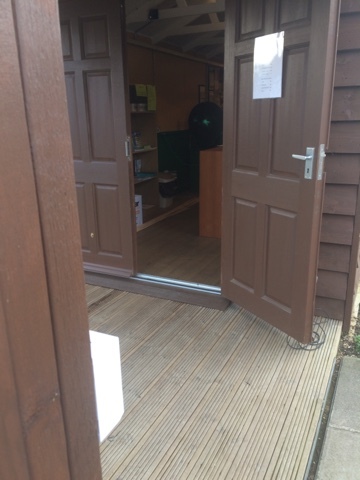 Dave spent the majority of today taking stock of the items for sale in the Buffer stops cafe, to get us ready for the new year. 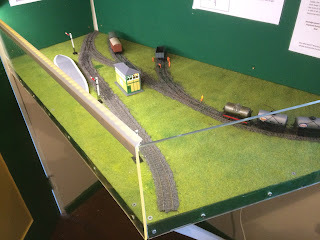 He later went on to add LED lighting to the small model layout, in the pavilion, which is used to explain the types of semaphore signals used on the railways. He also installed an amber LED in the model signal box to imitate a gas lamp and we plan to add some more buildings to the model and a bomb fire (so Dave can try out his LEDs that imitate a fire). I was going to spend my day working on the two aspect, ex-underground, colour light signal. However, after starting to remove the fixing and lenses on the signal, I soon got a pain in my back because the work bench is very low and I was constantly bending over (the bench was actual made of primary school tables and some plywood on top). I therefore decided my time would be better spent improving the work facilities than carrying on and possibly injuring myself. 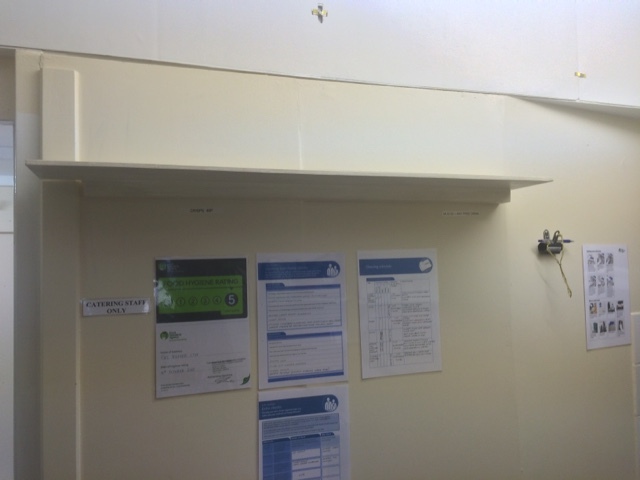 By the end of the day, a sturdy raised surface was erected and a vice attached so that members can carry out work safely. 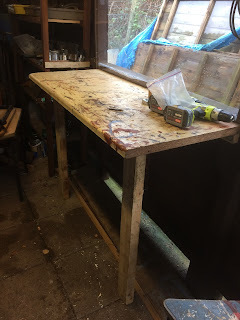 The tables are still present below the raised work surface, mainly for storage (especially longer items). I also plan to put a folding table further down the lean-to so that a volunteer can still work at a lower height, or have the full length table at a higher high. I then had a good tidy up and freed up some shelf space for people to put trays on to store bits and pieces off artifacts being restored (this was immediately put to use with the bits from the signal). I've also run in an extension lead so there is now power available on the work bench side of the 'workshop'. 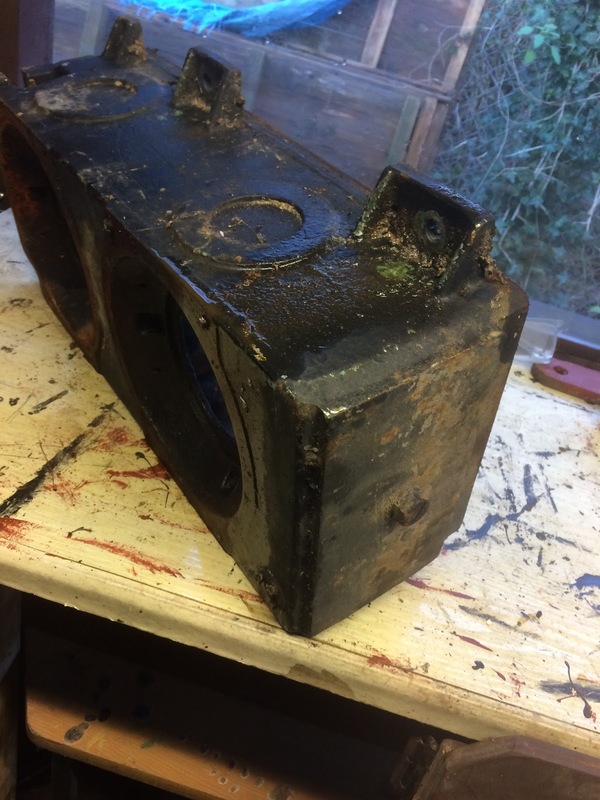 After this i finished of working on the colour light signal, and it now ready for paint stripping and then repainting. Reopening, A new building, Cowley Bridge, major site redevelopments. its all been happening! 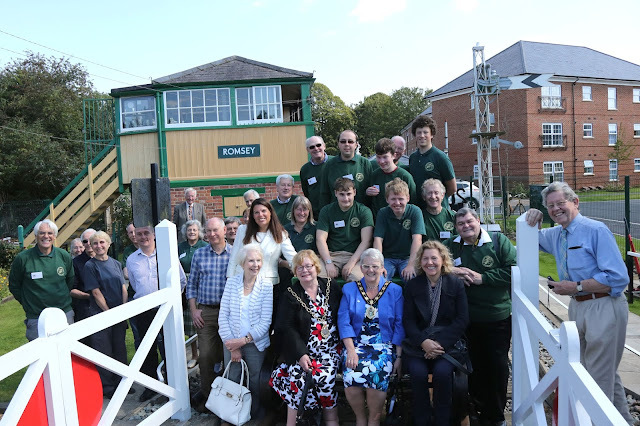 We at the signal box just wanted to thank everyone (members and visitors) for their support and all the work you put in, we look forward to another productive and successful year.